U.S. News and World Report has ranked UCLA Mattel Children's Hospital in eight specialties in the 2014-15 Best Children's Hospitals rankings. In the report, published today, the hospital was recognized nationally for excellence in the following categories: nephrology (ranked No. 10), neonatology (13), gastroenterology and gastrointestinal surgery (15), cardiology and heart surgery (25), orthopedics (27), neurology and neurosurgery (36),cancer (38) and diabetes and endocrinology (44). The Best Children's Hospitals rankings highlight U.S. News's top 50 U.S. pediatric facilities in each of 10 specialties. UCLA was one of 89 hospitals ranked in at least one specialty. "These rankings acknowledge our dedication to providing outstanding medical care to the patients and families we serve," said Dr. Sherin Devaskar, the hospital's physician-in-chief and UCLA's assistant vice chancellor for children's health, who holds the Mattel Executive Endowed Chair in the UCLA Department of Pediatrics. "We are especially proud of our nephrology program, which was ranked as one of the top two among pediatric hospitals in California, and of our gastroenterology and neonatology programs, which were both ranked in the top three in the state." Five-sixths of each hospital's score were based on patient outcomes and the care-related resources each hospital makes available; U.S. News gathered clinical data using a questionnaire sent to 183 pediatric hospitals. The remaining one-sixth of the score was determined by results of a survey of 450 pediatricians in each of the 10 specialties over the past three years. Physicians were asked where they would send the sickest children in their specialty, setting aside location and expense. "Every Best Children's Hospital deserves high praise," said Avery Comarow, U.S. News' health rankings editor. "We know how important it is to parents to have confidence in pediatric centers that show dedication and expertise in caring for a child facing a life-threatening, rare or demanding illness." Survival rates, adequacy of nurse staffing, procedure volume and much more information can be viewed on the U.S. News website, and in the U.S. News "Best Hospitals 2015" guide book, which will be published in August. 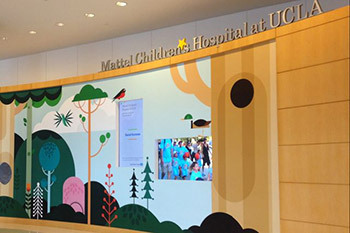 UCLA Mattel Children's Hospital, one of the highest-rated children's hospitals in California, is a vital component of Ronald Reagan UCLA Medical Center, ranked the fifth best hospital in nation and best in the western United States by U.S. News and World Report. Mattel Children's Hospital offers a full spectrum of primary and specialized medical care for infants, children and adolescents.